Can Fear of Happiness Get in the Way of Healing? Why is it so hard to get people to follow through on strategies that are good for them? Patient noncompliance can be one of the greatest roadblocks that keeps people from achieving their goals. And I recently came across some new research that might hold a clue to what holds some people back. You see, for some of our patients, the fear of experiencing a positive outcome might actually be stronger than their desire to heal. Now this isn’t really a new idea, but what is new is that it’s starting to be evaluated by researchers. A 2014 British Journal of Clinical Psychology study by British and Portuguese researchers led by Dr. Lara Palmeira looked into this issue. Adult Attachment, Social Safeness and Pleasure, and Depression, Anxiety, and Stress. They actually found that fear of compassion and happiness was highly correlated with depression, anxiety, and stress, as well as alexithymia (the inability to recognize emotions). Fear of happiness was found to be the best predictor of depression, anxiety, and stress, whereas fear of compassion from others was the best predictor of adult attachment. Now it’s important to point out some of the limitations of this research. I think this study could have made a stronger case if it hadn’t relied solely on self-reported measures. And, it’s critical to keep in mind that correlation does not imply causation. Although the researchers found a high degree of correlation between the fear of positive emotions and specific types of mental illness, this is not proof that one causes the other. However, I believe the questions raised by this study are important ones that warrant further research in this direction. While much research has looked at fear of negative emotions, studies have only recently started to investigate the fear of positive emotions. This line of research could have many possible implications for practitioners. Think of the number of times you may have tried to steer patients toward thoughts and strategies that would increase positive affect. But if patients fear positive emotions like compassion or happiness, they may automatically shy away from strategies that lead them in that direction. We need to be cautious, and mindful of our clients, when introducing techniques for building happiness and compassion because these can bring up complex emotions. 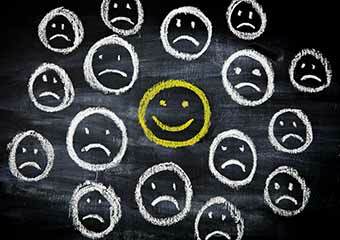 Have you ever worked with patients who seemed hesitant to experience positive emotions? What techniques have you found to be effective? Please leave a comment below. A lovely (self help) book on this topic is Living like you mean it by Ron Frederick. I use it with my clients. The Internal Family Systems Model by Schwartz is helpful for finding out how and why this pattern match of positive emotion with negative outcome has developed. Often there is underlying trauma that needs to be addressed first. Appreciate the recognition of fear relating to high energy positive emotions. This is a long need study. Having worked with those that any mention or feeling of something better summons an immediate low energy counter thought is presented with much resistance to the positive. Looking forward to more information on the subject. Thank You! If you read my 60+ page website, you will quickly see what a dynamic and engaged therapist I am with my clients: holisticdepththerapy.com. I utilize strategies and techniques from literally hundreds of schools of psychotherapy, philosophy, buddhism and the arts. Confrontation is the backbone of my practice combined with compassion, but there are so many subtle, gentle, resonant ways of confrontation that work so much better on a contracted, frozen in fear and despair soul than pushing for quick change because we want to feel effective, powerful as clinicians or cannot bear the misery of our patients. My very deep presence full of kindness, patience, empathy, and holding is a confrontation letting them know in a somatic emotional way that there is hope that reality and relationships can be different than they have been before. Of course, I have them engage in cognitive restructuring, parts work, internal structural integration, body centered psychotherapy, expressive arts and so on ad infinitum. I pull out all the tools, traditional and contemporary, but what my patients tell me again and again and again is that what really helps them heal and profoundly change, is the quality of my presence not my techniques which are helpful but very limited. Ron Siegel in his comprehensive course on mindfulness and psychotherapy said it so well when he explained that depression and anxiety are disorders of self-aversion and as we gently turn toward the pain instead of numbing and avoidance, it begins to loosen when in the presence of one who is deeply present and compassionate. whereas “refuting depressive thoughts often falls flat”. As he also explained, empathic connection itself offers hope”. But the best teachers of all are my beloved patients as well as my own long journey as a much younger person of rising from the jaws of severe chronic depression. I agree, Thank-you for sharing. Working as a nurse and Clinical hypnotherapist supporting people who are learning to make life changes and adapt to living with a chronic illness, I regularly witness that it is through being fully present with the person and providing a safe environment for them to explore their own feeling and emotions that they are able to move through the grief processes, heal and make necessary changes. Much of this could certainly fall into the psychological reversal category that gets addressed in TFT and ACEP’s tapping protocols (noted below in the comments). Helping clients identify and then address some of those resistances or objections that can stand in the way of them achieving their emotional or other goals can be extremely effective in making these positive shifts. Many thanks Ruth to you and all who have commented here regarding this topic. We can never be reminded enough how important it is to be mindful of the entire spectrum of emotions when working with others. This does not surprise me as I suspect it is something that I personally have to deal with and that I also see in others. It is also not a surprise when I reflect that when trauma, violations and assaults occur for people at a young age, it can be coming into a place where happiness was felt. This is especially so when the perpetrator breaches trust, is involved in grooming at any level or took advantage of another. In this way, happiness then becomes associated with something bad to follow and is not a safe thing to feel. It can signify danger and would be great to reclaim it as a place of safety and joy. Very challenging to work with and it’s great that the conversation has opened up to enable a greater receptiveness to individual responses. I think you just nailed it on the head here, Moira. I have long been aware of my own urge to dampen positive emotion so it is not ‘too much’. I first noticed it twenty years ago after teaching meditation classes and wanting ice cream to help manage the intensity of the depth and joy. Now I practice Scott Kiloby’s Living Inquiries and Natural Rest, a method to help people to turn towards whatever is arising without judgement. There is a specific way of seeing thought (hearing words, seeing images) and feeling sensations/ energy/ feelings that undoes the Velcro effect when they are all stuck together. It feels to me that PTSD activation can happen with any intense emotion, whether positive or negative. What on earth is “Toronto” alexithymia??? Thanks so much for this. I have become aware that I can feel uncomfortable and unsafe when experiencing an sense of spaciousness and calm. The familiar feelings of worry, thinking, planning and various physical sensations are gone. What is in their place, peace and emptiness is new, and anything new can feel scary if you have a history of being unsafe in childhood, or even adulthood. It is hard to drop the worry and vigilance that served you so well as a child and also as an adult. These days when I find peace and space unsettling I welcome the feeling of being unsettled, and do some breathing. I tell myself that I will get used to a more quiet mind and in time I will learn to love it. I just need to go there more often to become more familiar with it. I am talking about a life long journey here – I have been doing this work with myself (and with outside help) for over 40 years. However it has all been worth it as I am able to stay in a space of peace and calm for long periods of time now – I can welcome and embrace happiness. I am moving into this stage of my life with many more skills and much more confidence and comfort in being at peace. That is beautiful, thank you for sharing! Yes, Ruth, I agree with Nancy. Beautiful thoughts and counsel. I work for an organisation where we specialise in bereavement, grief & loss. Many of our clients in the acute phase of grieving are more then just hesitant about experiencing positive emotions, but will often feel guilt and shame over experiencing them as they think it dishonours the grief over losing a loved one. I find it quite powerful to just normalise their way of being, and help them to mindfully notice the whole range of emotions that arise during the session, and when a positive emotion arises, help them to link it back into their loved one who died. The clients find this really useful, and we know from the research with the bereaved, having a sense of a continuing bond, or relationship with the deceased is necessary for the bereaved to move forward. Agreed, thanks Michal for sharing! I think there was a time when people searched for truth in therapy, not happiness. This was addressed by Roger Callahan (TFT) and later EFT by one of his students. Roger found this resistance and had a tapping algorithm which then changed the client state from negative to positive. I have used this intervention technique numerous times over thirty years and virtually always successful in allowing the client to change thus receiving and allowing the necessary change to happen. Many clinicians are skeptical of this mode of intervention but the point of this is only to confirm the fear of change, success, positive feelings, etc. has been noticed and found a means to facilitate the change the client really wants. When not using the tapping technique, i.e., talk therapy, exploring the consequences of success and the imaginings that follow often bring up the issues that can be utilized for clearing away the fears by Ericksonian techniques such as, imagery, stories and creating new futures. EMDR has a very effective protocol for this very thing. “Positive Affect Tolerance” protocol. I wonder is there a connection between this interesting study and some clients challenge with anhedonia , as they seem to have an absence of joy in their lives. Having worked with clients with this condition , I have found it helpful to ask them to accentuate and talk about their good experiences as a way of retraining them to give themselves permission to begin to enjoy life again which they seem to have lost along the way. I wonder if the instrument used in this study: fear of happiness…isolates the feeling from the complex story of happiness that we construct in our head with beliefs and expectations. I find the latter to be the problem. The feelings can be felt and let go as all feelings are impermanent. My buddhist teachings have liberated me to some extent of what used to be the tryranny of attachment to feelings that happen with our cognitive amplifications that then generate complex other feelings and we confuse everything. Seeing this article appear on Ruth’s website warmed my heart. I’m trying to be happy about it, but that is hard for me. For me this article created a lovely moment of devine connection with God, the Universe, whatever you call that force as it kissed me on the cheek with a warm hug. Just this past week, while doing some deep reflection about my own fears and anxieties, I experienced a satori moment. I realized with my counselor’s help that a very large fear in my life is happiness. Reflecting on my own experience of anxiety waves, I realized that these occur usually at times when I’m feeling very competent and satisfied. When I’m happy. It is during these times of tranquility that my body/mind panicks and sends a wave of anxiety through me to warn me of impending threats. I realized that this reaction to happiness began when I was a child. My father raged. In our family with five children, we could all be having a nice time, when suddenly my Dad burst into a fit of frustration that included us being hit violently. The children didn’t know when to expect these outbursts, but good times began to seem less and less reliable as we grew up inside that uncertainty. I had a dad like that too. I had epilepsy too. I am also afraid of happiness. When I feel good or happy I wonder when the other shoe will drop, so I keep away from it. I need to get closer to it. Wonder how that will happen. In my work with clients and students, many individuals are deeply identified with their compensations, for injuries, for emotional wounds, and look upon these as their strengths. To release these for an unknown potential happiness or ease feels incredibly threatening. Just like working with a tight muscle requires acknowledgement and moving into and with the contracture before requesting any lengthening, the compensation needs to be honored for the rich survival mechanism that it is. Even the consciousness of the therapist/instructor holding this reality in mind will call up affirmations of the effort required to manage life, and the client/student is successfully managing in many ways. To help the individual move forward, the missing piece is often a grieving process. Since any change involves loss, even the loss of pain or dysfunction, that loss needs to be acknowledged, and stages of grief (and even return to grief over time if there are other burdens or setbacks) is an important part of creating space for new behaviors and feelings. Clients/students must be willing to bid farewell to who they were before and take small steps to crafting a new identity as a person who has happiness/less pain/new skills. Like sediment slowly accumulating on the ocean floor, they become a person with a history of evidence of new experience and tentative new feelings and confidence. They cannot reasonably be asked to believe or behave in a new way just because their state of less pain or a positive affect is more comfortable for the therapist/teacher or for their families. They can be asked to reflect on their growing histories of small steps and new experiences, with this becoming a self-reinforcing pattern over time. When these individuals begin to experience their agency and wholeness, they can become more adventuresome, allowing themselves a greater range of feeling and expression in general, including happiness. I appreciate what you say about acknowledging what it happening in the body – acceptance of what is before change can be made by letting go – losing – in order to move forward. Thank you for sharing your thoughts. What you are saying Denise resonates so much with my experience working with patients with complex chronic illnesses and disabilities. It helps me look at things with more patience, respect and compassion. You say it beautifully. Focusing and EFT are two modalities that I personally used that seem effective in reducing fear and anxiety around experiencing positive emotions. People with impaired attachment, people that had the rug pulled under their feet too many times, tend to operate within a mental frame that is primarily preoccupied with safety. So even a smiling face may be interpreted as dangerous. Using those methods in baby steps to ease up around what feels unsafe seems to be successful. Once the primitive brain feels safe, then you can engage the neo cortex in practices that reduce patterns of negative thoughts. I work with high functioning survivors of complex developmental trauma. It takes years with these very intelligent and insightful people to change their core psychological schemas and attachment patterns. But what is vital, in my experience, is not to push or overly encourage positive affects because that is essentially being misattuned to their experience which heightens their experience of being alone and bereft. What I find helpful is to lean bit by bit into the heaviness of depression and hopelessness. I sit down with them for months and years in the cold darkness until little by little they can feel a ray of warmth and light near them, my patient and compassionate presence and our growing connection. Even then, they experience pain, sorrow and grief as they take in the warmth of us it evokes the echoes of the barren landscape they once experienced. I have found for myself the key is to become extremely comfortable with painful affects, not only in the patients but in myself. Otherwise, I will unconsciously push them in subtle ways toward hope before they are ready. So I sit in the hopelessness and slowly, almost imperceptibly, hope is born. I don’t agree that you have to sit in your patient’s hopelessness. They need a beacon that there is hope, not an agreement that there is none. You can be attuned to their misery and that their perception of happiness is different, so that they know you aren’t dismissing them or giving them platitudes, but as a clinician, I also don’t want to lengthen the time of their suffering for their fear. They ultimately do have to confront it, and if we don’t push them somewhat, or at least show them where the door is, we participate as enablers of their fear. If you read my 60+ page website, you will quickly see what a dynamic and engaged therapist I am with my clients: http://www.holisticdepththerapy.com. I utilize strategies and techniques from literally hundreds of schools of psychotherapy, philosophy, buddhism and the arts. What a beautiful description – this is exactly what is needed, but it is so hard for people to find it seems. Thank you Nicole, for your sharing and Compassion. I myself have gone through the dark night of recovering from Past Chronic Trauma from childhood physical and sexual abuse and your words touched me deeply. I was lucky to meet my spiritual master in 1986 and am on the spiritual path ever since. It has probably saved my life in many ways. Again Thank you and if you have any advice, I will gratefully accept them. Isabelle check out Ruella Frank, Diane Poole Heller, Hakomi Therapy, IFS; Attachment Theory & Repair; Somatic Experiencing…re-regulation seems to be key, within & with others, in a lovingly & wisely, knowledgeably guided way. May our paths open up correctly for us, in touch with our truly highest wisdom! Check out Everett Considine witnessed IFS, 6 sessions no charge starting June 9th. Thank you Ruth for bringing this on going issues. Self regulation is an important part of balancing. and a crash.Working with mindfulness the body and learning to notice sensations help with self regulation. Holding both expansion and constricted states leads to more balanced states. On going routines of self care diet, excersice, meditations also promote state of grounding and self connectedness. (1) “if I feel happiness and then I lose it, I might be more miserable than I am now” Even an unknown that promises a more satisfying, comforting feeling is scary to some. (2) “I only know how to be sad or mad. What will I have to give up to feel happy all the time?”. People sometimes cling so tightly to everything they have (including their emotions). Perhaps they are so fearful of yet one more loss or they believe that if they change what they have they will lose all. Each of us as adults tend to unconsciously seek the biologically expected and necessary early developmental experiences (presence, connection and resources such as support, protection, nurturance and safe limits) we needed but which may not have been provided our parents or other caretakers upon whom we were totally dependent. Many of these needs in early life are required in the physical felt presence of another. The absence of the needed experience often can be accompanied by associated painful experiences of punishment or abuse It can be perceived as a life threatening experience. It is a traumatic wounding molds the organization of our present experience even as we attempt to heal from the experience. 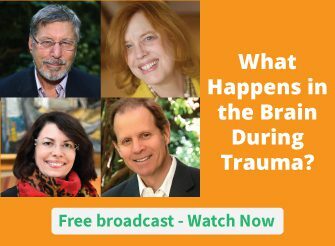 The traumatic experience forms a foundational pattern (mental organization and resulting behaviors) that allow us to compensate and survive without having the vital need met, even while we are driven to seek it. However when it feels as if we are on the brink of the possibility of obtaining the much-needed experience vital to our individual development we stand at the edge of the old trauma and revert to our compensatory and habitual responses ( the “repetition compulsion”). These processes are further complicated when early infant needs for physical contact become confused with the feelings and drives of adult sexuality. When we metaphorically stand at the edge of the cliff of feeling with another in the present the possibility of getting what we needed but missed from a specific caretaker a long time ago in the past, we may either pull back from the the possibility of the leap or make the leap with painful unintended and sometimes disastrous consequences, thus confirming our need to continue to compensate through retroflection, dissociation, incompletions, avoidance, addiction, etc. What is necessary in the healing process is to provide the client a with a mindful, bounded, safe reconstruction of the experience in its original feeling context but to give the client a parallel symbolic positive memory of their having gotten what was vitally needed. From this they derive new feelings and possibilities. I believe that mindful body-centered therapy is essential in these processes. Keeping safety foremost (for the client and yourself, respecting boundaries and limits ), understanding, acceptance, and caring are essential aspects of the process. Many useful ideas and concepts in the article and comments. Good luck and best wishes to all. I’m a recent M.A. graduate. How is this done? Congratulation on your recent graduation and best wishes for your future. I cannot give you a simple answer to your question of “How….” but I you might want to check out the sources I mentioned in reply to Christina. The PBSP web site contains much theory and process descriptions and Greg Johanson has a new book recently published you might want to check out. what sort of body-centered therapy do you think of. reading this article and your comment really resonate for me. They just make me want to sob in someone’s arms. I do see a therapist who also does body-work… but it’s too much like massage (on a table) and I don’t want it, lot of resistance. Maybe because it feels unpersonal, I wouldn’t feel safe I guess. Maybe because it’s on my whole body, but just their hands… instead of body to body. It feels horrible. You might find it useful to to look into PBSP (Pesso Boyden System Psychomotor), the work of Al and Diane Pesso. Al regularly conducts trainings in Europe and many clinicians from Europe come to Boston to train with him there, as well. You might have a good chance of fworking with Al or finding a clinician who uses PBSP somewhere near you. I would recommend, for your reading, the Hakomi work developed Ron Kurtz, and that of his early associates of Greg Johanson and Pat Ogden. Other useful intro reading might include Eugene Gendlen’s work on Focusing and Herbert Benson on The Relaxation Response. I hope you can find a therapist with whom you can relax and feel comfortable and who can work with you to accomplish your goals. Good luck and very best wishes. Your input very much resonated with me as well! I was raised in a household where physical affection or even verbal expressions were just not part of the interaction. I have been blessed to have friendship relationships with an older lady and a safe older gentleman who very much helped to fill in those terrible emotional voids that produced years of longing for healthy emotional and physical affection along with a terrible fear of overtly seeking it in any way. Nursing creates some safe and appropriate offering of emotional support, but I would also love to hear you elaborate a little on what the kind of therapeutic encounter you describe would look like. Seems a shame in some ways that you are retired. I think the world could use more therapists with your kind of sensitivity and insight. I am glad that you found the comments useful and that you have been able to find and take in the safe experiences you have found to fill past emotional voids. Thanks, also, for all that you do as a nurse. Your work is so important and so often not adequately recognized. In regard to your question, it is difficult to briefly elaborate on what a typical therapeutic encounter would look like as the process can be complex and varies depending on the place the client is in. I believe that it is necessary for the therapist to have done considerable personal work in order to know the inner territory of the client in order to safely be with the client in that space before it is possible to lead the client to a new place. I was fortunate early in my career to begin training (and continue that training and personal work over the 25 years of my clinical work in private practice) with many pioneering leaders in the field of experiential clinical psychology using methods that included the body. I had to terminate my practice when was hospitalized and severely disabled from the damage done by cancer in my spine, liver and lungs arising from exposure to Agent Orange while serving in Vietnam. Words cannot express the gratitude I have for nurses. Thank you! Thank you for the info. Just yesterday I had someone in my office whose mentality is so. Secondary gains like getting attention, learned helplessness, not having to be accountable or having low expectations keep some folks stuck in their mental illness. What works for me is to set appropriate boundaries re: the need for the patient to participate in his/her therapy and be compliant with recommendations. Sometimes a bit of “tough love” approach pointing out the patient’s passivity works for me. Reviewing the treatment plan, measuring progress, and pointing out specifics re: the individual’s poor compliance is the best approach. Many times patients respond to this because they realize that you care about their progress. People with ongoing negative feelings can come to believe the feelings are literally a part of the who they are. So to work towards positive change and release of the negative can cause fear – they won’t know who they are without it, and if negatives are deeply embedded, can cause a fear that the person will not survive without. It can be an addiction to the negative as it equates with (even a negative) sense of self. I work to educate what ego is, and include forgiveness of self and others. These assist the person to gradually release the excessive attachment to the feelings and thoughts of the negative. I include connecting the person to an infinite, positive energy that created/creates them which opens them to that whole energy that is already their as them. Self healing and clarity are allowed in this place. Depression can have a more seductive, ‘sticky’ quality, where ego has set up various layers of justification and excuses of why it must remain. Those gradually can be investigated to reveal the ‘set up’ to the person so they may see the fallacy of ego. Finally, non-judgment and sincere compassion cause the self healer to come forth in the person – they are imperative. I recommend asking if he or she believes that their fears are stronger than their desire to heal? I’ve observed what appears to be a sense of shame by some of my clients if they fall asleep during a massage therapy session? They come to relieve stress, yet fight or deny letting it go. Good article. Thank you. What I find works well is having the client relate to past experiences, where feeling happy did not have a negative repercussion, or was not snatched away from them. These episodes are there, in their memory banks, but they’ve been disregarded by their strong negative bias. I’ve found that it isn’t so much teaching techniques for building happiness, but teaching techniques for recognising the happiness that is already there. Expectation is a strong lever in therapy. Helping clients anticipate the good, AS WELL as the bad has positive outcomes, I’ve found. Thought Challenging is very good here. I work with clients who are abused in their early childhood. Their survival instincts tell them to be alert, tense, controlled and vigilant. The state of happiness includes relaxation, openness, warmth and softness. That scares the hell out of them. During the abuse they were told to relax. The word has become a trigger for them. Often the abuser (s) were drunk and ‘happy’ making jokes and making fun of the victim. Her associations with the word happiness are not very pleasurable. In working with the body, I start with directing their attention to neutral feelings. Then in babysteps explore how it is to let go of some tension and tolerate the new sensations that arise. Eventually they notice that the body hurts less if you are not contracted all the time. Learning to say no and defend themselves is also necessary to become able to say yes and relax in proximity of another person. This is a long and patient process but gives way to graduallly allow other positive feelings and openess of heart without being in a state of terror. I think Mirjam has mentioned the “key,” that is, happiness is a “state” and is the result of a number of different internal orientations all being available. Where those internal orientations are prevented from occurring, the state we ordinarily call “happiness” cannot occur. It’s really not too complicated: we adapt ourselves to the devils we know, rather than risk opening things up to change and possibly getting a *worse* devil. The way out of this dilemma is to somehow find the ability to take small risks of exploring change. By assimilating wholistically (mind,body,”spirit”) the results of small changes, the psyche finds enough room to maneuver to a more relaxed place, from which it’s yet easier again to maneuver. This process is characterized by gentleness, openness, compassion and — dare I say it — outright love. The secret is figuring out how to create the conditions for positive psychic maneuvering when the very act of maneuvering itself feels scary. This is the best response I’ve read so far. There is always a good reason for seemingly illogical behavior. If, when growing up, happiness makes you a target, hyper-vigilance is heightened by any approach to feeling happy. My mother leaps to mind!!! I have worked more with the fear of connecting with emotion than fear of compassion or happiness. How I have attended to this was just to be curious about the fear. How has this fear served the client? How is it serving them now? Track the way it manifests in the body and work with what comes up from there. Usually it’s a child part that has been wounded and has created this map to avoid feeling. It will have beliefs that need to be reframed and phiysicalised responses that need to be worked with. I have found this gradually creates new neural pathways. If we think of happiness as another emotion that will be embodied with its related physical manifestations. Instead of being embodied in term of contraction and tension (such as fear and anxiety) it will be embodied as a release of tension that (if you listen carefully to your body when you are happy ) can be quite daunting. For those who are afraid of the sensation it is similar to the release of energy you would feel if deciding to jump off a cliff and feel free. So the mindfulness approach to identify and become familiar to those sensations becomes the best point of entry to healing. it is the Reichien concept of “Anguish of pleasure”, so we have to titrate expansion in order there is not a big contraction after…. thanks Ruth for the post. Fear of happiness does not mean that there’s a reason to avoid happiness IMHO. If any sort of fear arrives then one uses that as a chance to see deeper and gently challenge the fear to the degree it can be tolerated. Happiness can never hurt. Fear can hurt but then so can just about any unpleasant feeling. Hurting and harming are two different things. What harms is when fear goes unchecked. Unfortunately that happens all too frequently in life as it is in the westernized world. The real question presented here is what will enhance the will to heal as opposed to the will to hide or avoid change?